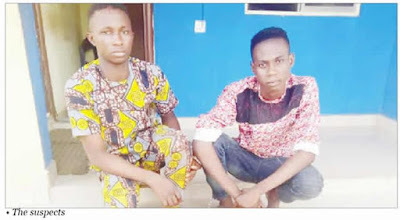 Men of the Ogun State Police Command have arrested two men, who allegedly robbed a female lecturer at the Unity area of Iyesi Ota in Ado-Odo Ota Local Government Area of the state. The two suspects, Ramon Akindele, 22, and Paul King, 20, were arrested following a distress call by the victim, one Busola Salako, at about 11.00pm on Friday, November 30, 2018, that her house was under the siege of armed robbers. On receiving the call, the DPO Onipanu Division, Sangobiyi Johnson, reportedly mobilised anti-robbery officers to the scene and the two suspects were arrested with the help of members of the community. The victim explained to the police that she was in the house with her maid when the generator suddenly went off, which prompted her to ask the maid to go and check what the problem was. She added that immediately the maid opened the door, the two suspects held her and covered her mouth with a piece of cloth and threatened to kill her if she made any noise. The maid’s scream when she was suddenly grabbed alerted Salako, who quickly bolted the door from behind before making a distress call to the police and some members of the community. The Police Public Relations Officer for the command, Abimbola Oyeyemi, said upon interrogation, one of the suspects, Akindele, stated that it was King, who gave him and one Raphael Solarin, now at large, information about the victim. He stated that King lives in the same neighbourhood with the victim, which gave him an opportunity to know more about her movement. Items recovered from the suspects, according to the PPRO, are one UTC knife and an ordinary knife. He said the Commissioner of Police in the state, Ahmed Iliyasu, had ordered the immediate transfer of the suspects to the Special Anti-Robbery Squad for discrete investigation and prosecution.